Want to start a program in your club? 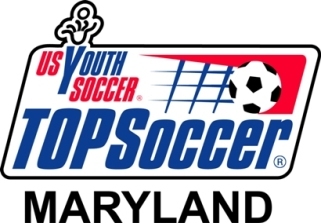 Want to learn more about Maryland TOPSoccer? US Youth Soccer TOPSoccer (The Outreach Program for Soccer) is a community-based training and team placement program for young athletes with disabilities, organized by youth soccer association volunteers. The program is designed to bring the opportunity of learning and playing soccer to any boy or girl, ages 4-19, who has a mental or physical disability. Our goal is to enable the thousands of young athletes with disabilities to become valued and successful members of the US YOUTH SOCCER family. How do I participate? Contact your local US Youth Soccer State Association office to find out more about getting involved with a local US Youth Soccer TOPSoccer program. You can find State Association by clicking here. Or, simply contact your respective US Youth Soccer TOPSoccer Committee member by using the e-mail addresses listed below. Identify the need in your area. For what type of disabilities do you need to plan? Are you able to fulfill these needs? Check for any restrictions placed on the facility (ies) you plan to use. Are they equipped to handle athletes with physical disabilities? Check with your soccer insurance carrier. Contact established programs for information. Contact your local school districts and universities. Create a list of people who are able to assist you. Get the support of your State Association and Regional -TOPSoccer Representative, and use them as resources. The unique thing about TOPSoccer is that each program is different and is created around the needs of the participants. Additionally, TOPSoccer athletes are placed on teams according to ability, not age. Create rules to fit specific needs. TOPSoccer programs can have very modest beginnings. Above all... keep it simple... KEEP IT FUN! Registration procedures should be the same as those used for regular league teams. Registration form should include a section for medical history. Athletes with Down-syndrome should be required to have a current x-ray. If the x-ray is positive for their safety, it should be strongly recommended that they do not take part in team play. In some cases medical waivers may be required. Placement is made by ability not age. Assessment test should be made available upon request. Ensure that the experience is meaningful for the participating athletes, and one in which they feel they have made a contribution. through US YOUTH SOCCER and state association sponsored coaching courses. Costs vary depending upon your registration fees and insurance fees, and uniform and equipment costs. Cost should be kept low and affordable to all possible participants. Grants are available through US YOUTH SOCCER. There are philanthropic entities, such as the Shriners which offer assistance. Research others in the local community (Lions Clubs, Rotary Clubs, etc.). Approach local companies or corporations for cash or in-kind donations. Use color coded goals or nets (e.g., red goals/yellow nets). Have a ball for each athlete.